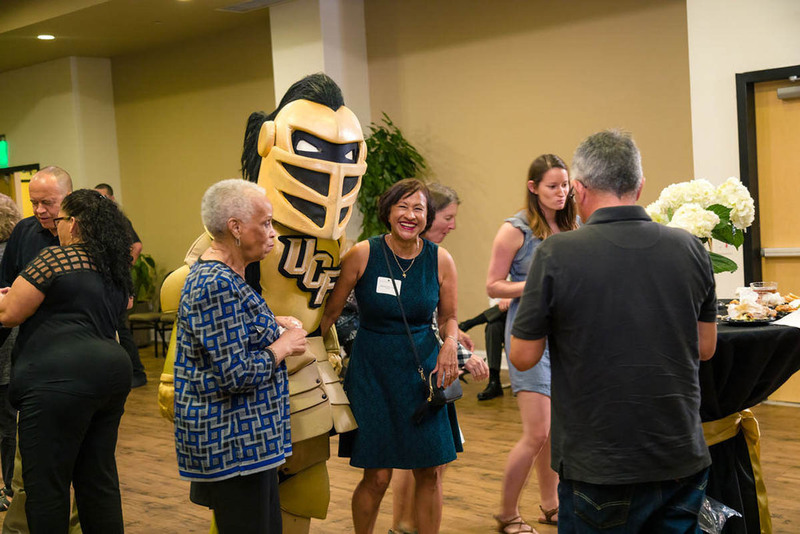 It takes more than 13,000 employees to create University of Central Florida’s diverse, welcoming environment and for students to grow, learn and succeed. President Dale Whittaker recently recognized some of those outstanding employees at Human Resource’s 46th annual Employee Awards Program held at the Student Union Pegasus Ballroom. The 2018 program recognized University Support Personnel System employees and Administrative & Professional employees, as well as new retirees. Awards were given to the employees of the month and long-time employees celebrating significant anniversaries in five-year increments up to 45 years. Ina Carpenter, an executive assistant in Parking Services, was presented with an award for 45 years of service. Carpenter was the first employee hired when the university established the parking office to sell permits. Michael Callahan, director of information systems in Burnett Honors College, received the Gabor A&P Excellence Award of $2,500 for contributions above-and-beyond the normal scope of duty. Debra Urban, senior administrative assistant in the College of Nursing, received the USPS Employee of the Year Award of $2,500 for exceptional performance. Emloyees can nominate co-workers during the year for employee of the month https://hr.ucf.edu/employee-month-new/, from which the annual award is selected. Crystal Colvenbach, public affairs coordinator in Student Health Services, was given the United Way Advocacy Leadership Award for outstanding initiative and leadership during UCF’s 2017 United Way campaign. The surplus property team in Facilities & Safety was awarded the 2018 Prudential Productivity Award by Florida TaxWatch, which acknowledges individuals and organizations that reduce costs and improve services for taxpayers. The team includes Joshua Haupt, Hugo Infinger, Russ Kraft, Andrew O’Mara, Lance Watkins, Christopher Rausch and Eli Rivera-Maldonado.